The Killer Vees, featuring Jeff, Tommy, Matt, and Bennett Vee will reunite one last time to say goodbye to their father, uncle, grandfather, mentor and bandleader Bobby Vee. Complete with Bobby’s touring string section and cast members from the smash hit musical Teen Idol: The Bobby Vee Story helping out on background vocals. 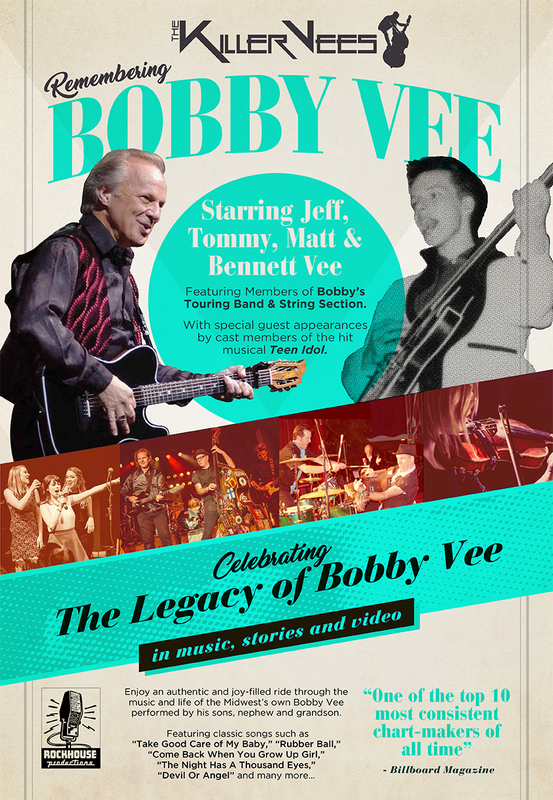 The show will feature video and stories from Bobby’s career along with all the hits. Bobby’s nephew Matt Vee (son of founding Shadows member Bill Velline) will cover the lead vocals. “For me to be singing my dear uncle Bobby’s songs is the greatest privilege and honor I can imagine. Bobby is my favorite singer of all time and I was so lucky to be part of his shows over the years as lead guitarist and backing vocalist. It will be a night to celebrate and cherish!” Matt said. Bobby Vee’s career started in Moorhead, MN on February 3, 1959, when his group The Shadows volunteered to help fill in after learning about the plane crash that took the lives of Buddy Holly, Ritchie Valens and The Big Bopper. “My Dad always remembered that night as kind of surreal,” said Tommy. “He said it was kind of like a rock and roll wake… Everybody was in shock.” And so began an international career that spanned 52 years and saw Bobby tour the world and land 38 songs in the Hot 100. Bobby Vee passed away peacefully surrounded by his family on October 24, 2016.